As we entered the aircraft, we were greeted by a flight attendant who directed left, to the forward business class section. This larger, front cabin has 4 rows of seats in a 2-3-2 layout. A smaller, 3 row business class cabin is located behind the galley at door 2. We were seated in 2J and 2K. Blankets and slippers were waiting for us and there were lumbar support pillows that were attached to each seat cushion. As we got settled, a flight attendant introduced herself and offered to explain the features of the seat. She addressed each of us by name and told us to push the call button any time we wanted something throughout the flight. Lovely! Shortly after, we were offered a pre-departure beverage. We chose the "Raspberry Welcome" and still water. The Denon headphones were of the noise-cancelling variety and much higher quality than typical airplane headsets on other carriers, though I still preferred my Bose Noise Cancelling headset. Turkish Airlines is one of the few carriers that offers a dedicated onboard chef on longhaul flights. While this may sound a bit gimmicky, it shows how much care goes into the meals on Turkish flights. Our chef came around the cabin before takeoff to introduce herself, distribute the menus, and ask us to fill out the breakfast selection card. As we began our taxiing to the runway, she returned to tell us her recommendation for the entrée (the salmon) and take our meal orders. After taxiing for a while, we had a smooth takeoff from JFK airport. 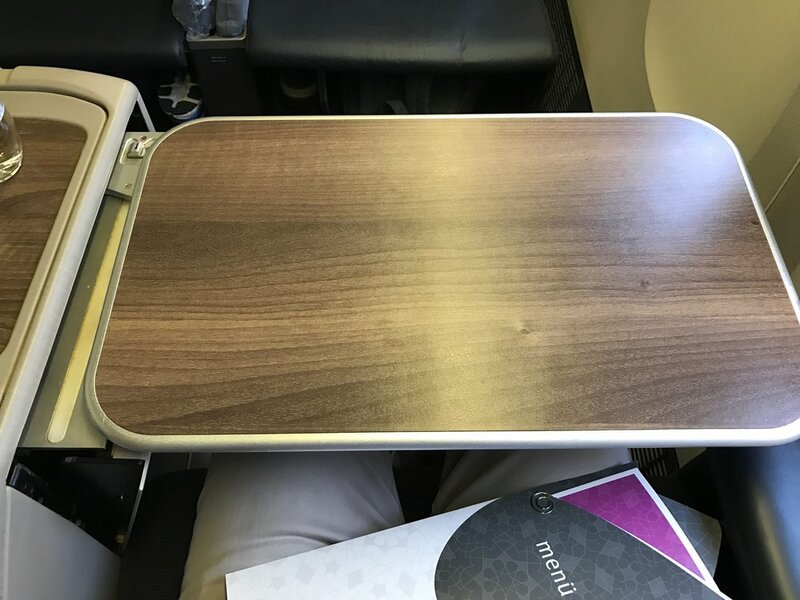 At the time of our flight, Turkish Airlines did not allow any electronics during takeoff and landing (even in airplane mode), so we didn't get any photos during these stages of flight. Dinner service began shortly after takeoff, with tray tables being set. Silverware and napkins, along with a tray of butter, herbs, empty bread basket, olive oil, salt, and pepper were distributed. There was even a small flickering electronic candle placed on each table - a lovely touch. Trollies were then rolled down the aisles with drink selections. About 90 minutes after takeoff, the first course was served from a trolly. The food was presented beautifully, and we appreciated being able to see the options before making our appetizer selection. Drink refills were not proactively offered until just before the entrées were served - about 2 hours after departure. Entrée plates were delivered individually, rather than off a cart. We had preordered 1 vegan (VGML) meal, which consisted of grilled tofu with vegetables and rice. We also ordered the chef's recommendation - the salmon. Both tasted excellent and were plated beautifully. Dessert options were displayed on the trollies, along with coffee, tea, fruit, and cheese options. We tried the blueberry cheesecake and had some herbal tea from the extensive selection. 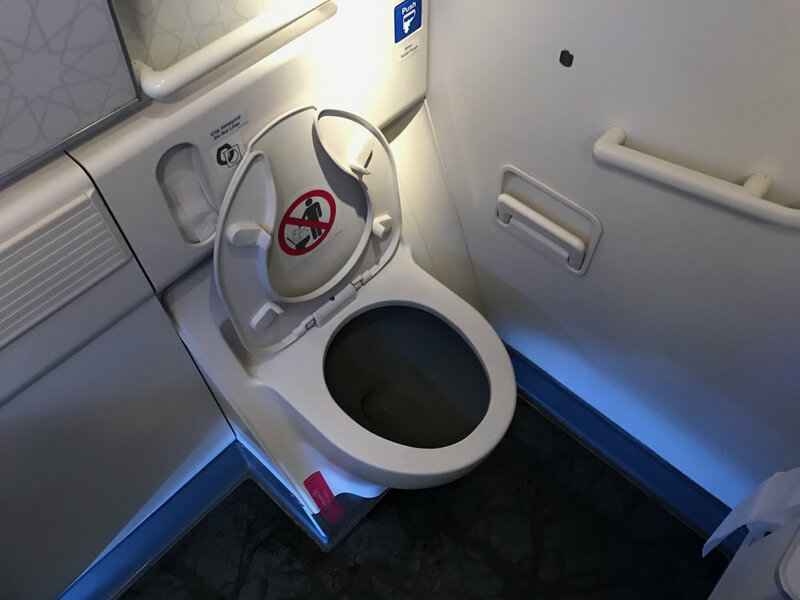 I love when airlines offer more options than just "tea"! The tea was served in a beautiful mug with a metal latticework design. After the dinner service was complete, mini water bottles were distributed. The lights were dimmed and hot towels were distributed. A flight attendant came around to offer turn-down service with a mattress pad, pillow, and comforter. I happily accepted and went to the lavatory to brush my teeth. The bathrooms were pretty standard and kept relatively clean throughout the flight. There were several branded products on offer. I particularly appreciated the individual pouches of lemon-scented hand wipes. Overall, the seats on our flight were quite comfortable, though definitely showing their age. There is little privacy in Turkish Airlines' business class, which gives the cabin an open, spacious feeling, but also makes you feel exposed. If you're traveling with someone, I'd recommend a seat pair by the window. 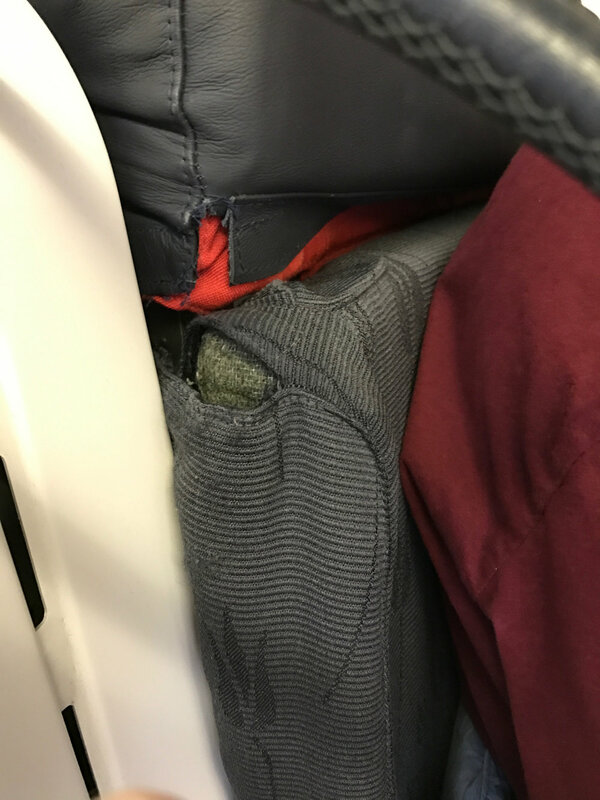 If you're flying alone, you may want to gamble with an aisle seat in the center section, and hope the person in the middle seat chooses to access the aisle on the opposite side of the cabin. 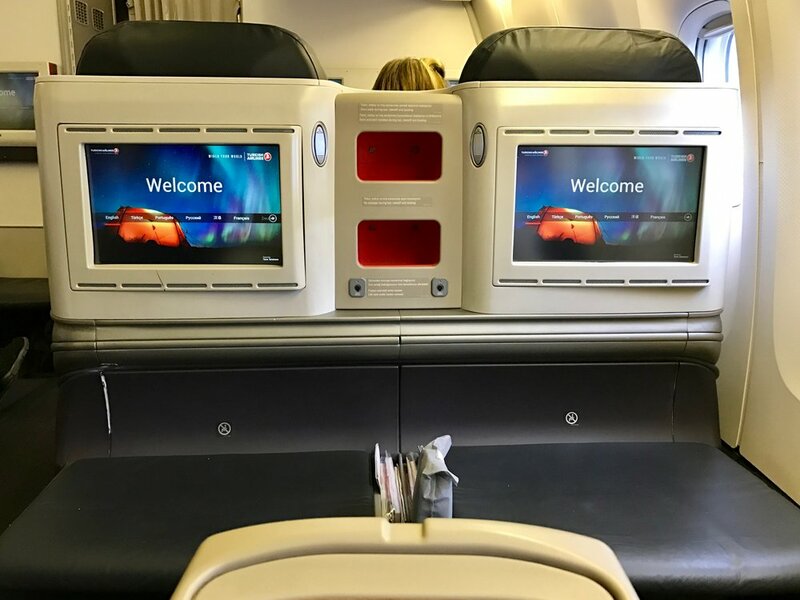 The footrest is nicely designed, as it can be used at any time (even during takeoff/landing), provides easy-access storage underneath, and offers abundant space for moving your feet around while the seat is in bed mode. There is no cramped 'cubby' for your feet as with some reverse herringbone business class seat layouts. Standard power outlets are at every seat, along with USB, ethernet, and headphone jacks. I wonder how many people have ever used the ethernet jacks (and if they even work)? The IFE remote is located in a shallow cubby alongside the bottom seat cushion - I inadvertently pushed some buttons on the remote by storing other items in this space. Another small annoyance with this location - the remote is lit up and shines right on your face when the seat is fully reclined into bed mode. I ended up extending the remote and letting it dangle off the edge of the seat while I slept. The seat controls are pretty straightforward and include a slow back massage function. Each individual's half of the middle armrest between seats can be raised as a privacy screen, though you lose the armrest functionality (so you probably will only want to use it while fully reclined). It includes a small reading light underneath - a smart location that won't disturb sleeping neighbors as much as an overhead reading light might. The turndown service is a nice touch - another area where Turkish Airlines' soft product excels. The mattress pad was a welcome addition to the bedding; I appreciated the extra padding. The blanket was a bit short in length and somewhat worn from many washings. The in flight entertainment system offered a decent selection of content. There were a few brand new movie titles, but mostly a bunch old favorites. The screen was somewhat small, especially given how far forward the seat back is in front of you. The UI was not very intuitive and it was cumbersome to use the remote to make selections. Additionally, the screen was quite dim, even when on the maximum brightness setting. It was difficult to see any detail of darker movie scenes while the cabin lights were on. Since the recent electronic device ban, Turkish Airlines now offers free wifi on US flights, which is a nice perk. Between the elaborate meal services and sleep, I didn't get to test it on this flight. After dinner, I finished my movie, then went to sleep. I managed to get a solid 4 hours before waking up for the next meal service. Breakfast service began about 2 hours before landing - a bit early for those looking to maximize sleep. We had chosen to be woken up for the meal, however. The vegan special meal came with sliced fruit, berry compote, Smart Balance buttery spread, and jam. We were offered our selection of warm bread and pastries, as well as tea and smoothies. We also got the omelette. All of the food was good. After breakfast, the flight attendants prepared the cabin for landing. We had an easy touchdown and headed to the Turkish Airlines lounge at IST for our long layover. 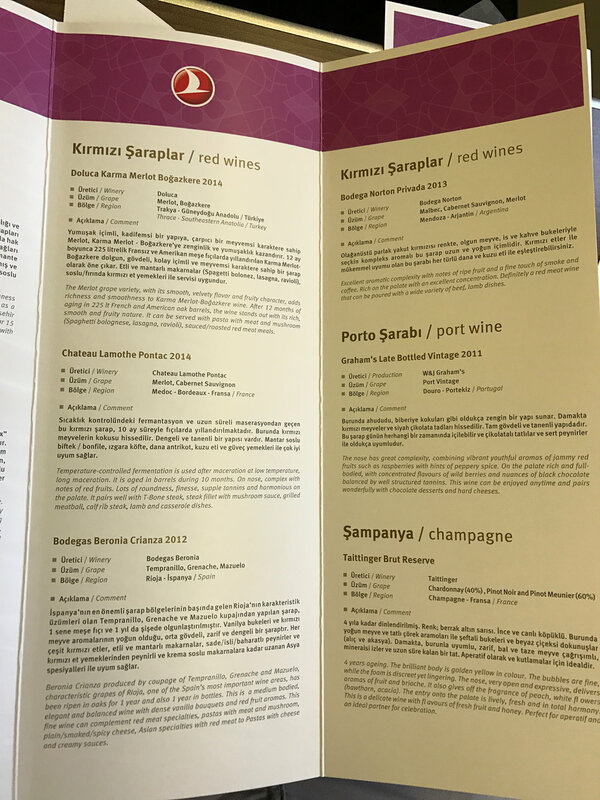 This was a lovely flight in Turkish Airlines business class. The seat, while comfortable, is simply not competitive against airlines that offer all-aisle access and far more privacy. What Turkish Airlines lacks in terms of hard product is made up for by their warm and attentive service. Get the latest reviews delivered to your inbox. We hate spam too! We'll never sell your email address. Unsubscribe anytime. Please check your email to complete the sign-up.